now reading: Will Hitler Be the First Person That Aliens See? Will Hitler Be the First Person That Aliens See? On November 16th, 1974, humanity broadcast its existence to the universe louder than ever before. 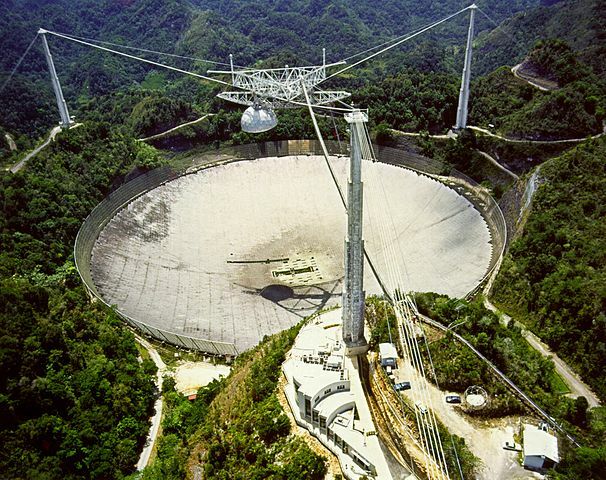 Nobody heard it of course, not even anyone stomping through the dense foliage and lush trees encircling the immense Arecibo radio telescope in Puerto Rico. It was not sound, but silent radio waves that relayed the booming message, fired at a frequency of 2380 MegaHertz, with 1000 kiloWatts of power (that's pretty high), towards the globular star cluster Messier 13, which is more than 20,000 light-years away. Containing, among other things, the numbers one through ten, a graphic of the solar system, and an image of the double helix structure of DNA, the message was penned in the language of science, meant to convey a warm "hello" to anybody listening. If television broadcasts can escape into space, this presents quite an intriguing situation, one popularized by astrophysicist Carl Sagan in his book (and later a film) Contact. Nazi Germany's telecast of the 1936 Olympic Games Opening Ceremony in Berlin was a monumental step forward for television. The ceremony, in which Adolf Hitler prominently figured, reached 41 countries across the planet. But did it also reach outer space, and by extension, could it reach aliens? Once radio waves from Earth reach outer space, they travel relatively unhindered at the speed of light. But getting to outer space is the tricky part. The aforementioned ionosphere, where the sun's intense ultraviolet light breeds an interfering jumble of ions, reflects most radio transmissions up to a frequency of around 50 MHz. Lower frequency signals can occasionally break through, however, and Hitler's broadcast was transmitted at a frequency of around 40 MHz. Still, as Shostak described, that signal, and most other television signals, are sent with low power. So while they may be able to propagate to distances on the order of hundreds or perhaps thousands of light years, the signal will be so quiet that a theoretical alien race would have to be listening unbelievably intently and in precisely our direction. It would be like "trying to detect the small ripple from a pebble dropped in the Pacific Ocean off the coast of California - from Japan." But let's play the "what if" game and say that, against all odds, an alien race somehow managed to pick up Hitler's speech (as is exactly what happened in Contact). In that case, they would likely not be able to tease out images or audio. They would, however, recognize it as a technological signature, unnatural in origin. They would know that they are not alone in the universe. Imagine if we ever met that species? "Hey, we got this message from you a while back..."
"Oh yeah. That was actually humanity's most evil dictator."